I have a new blog series at decomP Magazine, where I am also the Prose Editor. To see the original post, please go to the decomP blog. I happen upon Pansodan Art Gallery on a Tuesday night, during their weekly social, and end up intruding into a tight room with iceboxes full of water and Mandalay beer bottles. Smatterings of French and German punctuate the air, but mostly it’s English, a colonial legacy here in Myanmar, that lassos me further in. Pansodan’s Tuesday gatherings are popular among academics and artists around Yangon, all of whom hope to protect and safeguard Burmese art. “Safeguard” from what, I’m unsure, but they do seem off-put when I ask them about the few Burmese artists I know, the ones who perhaps sold out. I ask them about the Burmese American author Wendy Law-Yone, and they look at me like “Burmese American” is a curse word. I pass through three interior rooms stock full of large square paintings arranged so close together that they appear like large quilts strung along every wall. I am told by a burly journalist sitting atop a beer case that there are many artists in Rangoon, but not enough art spaces. Pansodan seeks to correct this by opening more: Pansodan Scene, which has a café, and Pansodan Bookshop. When I came to Yangon I meant to write about George Orwell’s famed hideaway, the Foreign Correspondent’s Club. But Pansodan carries an irresistible aura of intrigue. Tucked into the second floor of a small building, inside paintings sit stacked and bound, tilting against the walls. There is an ambiance like warm breath. Pansodan’s balcony overlooks a thoroughfare walled with off-white stone buildings. I bum a cigarette from Stuart, a graduate student from New York studying anthropology, and cynically ask if he’s come here to find some ‘lost tribe.’ He isn’t amused by my question, and says anthropologists don’t really do that anymore. “What do they do?” I ask. Stuart and I chat for a while, half bored with each other. We each take turns looking behind us to see if some long lost friend has suddenly appeared at the party. I wonder how long it will take for this anthropologist to ask me something personal. Will it be my race? My age? My sexuality? I can see in a moment of silence, when he peers at my collar, that he’s almost there. We’re interrupted by a squad of anthropologists who enter the gallery, pouring glasses of wine and making a ruckus in the small exhibition room. Stuart greets an anthropology student from Colombia who wears a polo and brags about having recently met James C. Scott. It’s not long before they’re going at it, arguing about the merits of “obscurity in academic writing,” tossing quotes from graduate courses they took the semester before, name dropping Foucault, Nussbaum, and Derrida. All the while they’re both looking at me like I’m a referee. No. Like I’m a cat, being culled by two potential owners. All this culling makes me feel very, very special, which so far has been a rare feeling here in Myanmar. If I lived here I’d probably be like them, arguing and culling every week at Pansodan, a haven for haven-seekers. 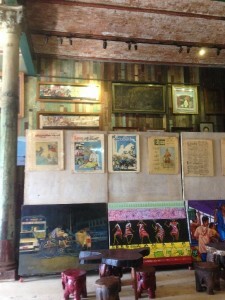 Pansodan is run by the artist Aung Soe Min and Nance Cunningham.